Focusing on the mundane two square miles where he grew up in Coventry, painter George Shaw confronts nostalgia in his work which lies at the edge of tradition, writes Matthew Cain. 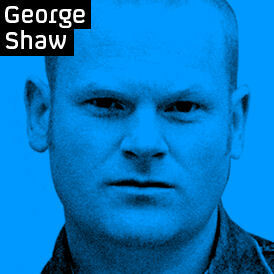 George Shaw was born in Coventry in 1966. He studied at Sheffield before later doing an MA at the Royal College of Art in London. He now lives and works in Ilfracombe, North Devon. He has been nominated for the Turner Prize 2011 for his retrospective The Sly and Unseen Day. Shaw is a painter whose subject matter is the council estate in Coventry where he grew up – and often the mundane everyday objects within it. He paints exclusively in the Humbrol enamel paint used by young model-makers, which again gives his work a unique, instantly recognisable quality. This unconventional choice could be understood on many levels; it gives the work a child-like, humble quality while on the other hand could be read as a defiant rejection of the history of art and, in particular, oil painting. There is also a haunting quality to the work and much of it suggests a passage of time and even hints at the inevitability of death. Shaw told me while looking around the show that he identifies with writers more than artists, which makes a lot of sense; for me, his paintings constitute fragments or even pages in a personal and very moving memoir. According to the judges, Shaw’s work lies at the very edge of tradition. This is because he gives the traditional form of painting his own unique twist; he works exclusively in Humbrol enamel paint, the kind of paint used by children on Airfix model planes. But in launching this show, Shaw hinted at a possible future change of direction, claiming that it represents “the beginning of the end of the Coventry years”.